The end is in sight… well, for me the end of the first of many phases of this trip as I’ll be back here in Mae Sot in a couple of weeks, but for Jackie it’s the final day of her first time to Mae Sot and more importantly the first time back within touching distance of her homeland (you can read more on previous post here). As I said before, I cant begin to imagine what that must feel like, not just for the thousands who are living here who have fled but also for those who come here for the first time, often opening up old wounds from many years ago. A somewhat more relaxed day today as I made the decision during yesterday that I can re-shoot people when I return in a couple of weeks time – so we spend today just wandering around and doing some shopping in the market and also down at the Rim Moei market down at the border. But I can’t keep my camera locked up for long and whilst stopping off at AAPP to collect some books I decide to re-shoot Aung Khaing Min and also by complete chance I bump into a friend of Moe Maung Maung (from Norway) – he had told me about Aung Kyaw Oo (not the Aung Kyaw Oo who works at AAPP) and by chance here he was in the AAPP office! So we snap away and get two portraits for the price of one – done using the backdrop of the huge poster of my project thats on the wall in the office. Aung Kyaw Oo was jailed twice for a total of 5 years – first time in 1988 (4 years) and then again in 2008 (1 year). He was a member of the All Burma Student Demo Movement Organisation & All Burma Student Union re-establishment committee. 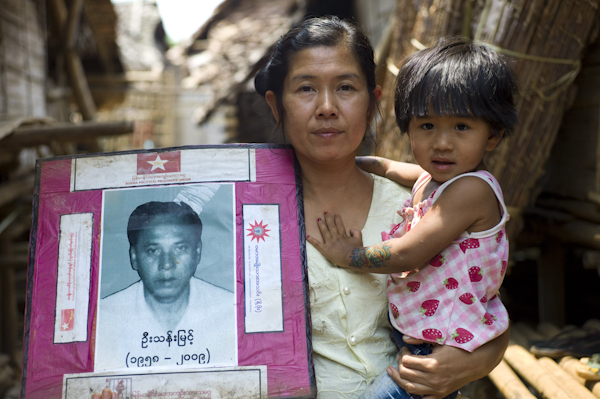 Aung Khaing Min was jailed in 1996 for 5 years in Insein and Tharawaddy prisons. The name on his hand is his brother Chit Ko Lin who is serving a 7 year sentence in Pakokku prison. Back in Mae Sot after the hectic weekend touring the camps down south but there’s no time to put the feet up and rest. We have to leave on Wednesday evening back to Bangkok and have a lot to cover back here in town before we go. So another early start but perhaps too rushed as over a breakfast planning meeting a jug of milk goes over my laptop… ‘no use crying over spilt milk’ couldn’t be more appropriate and thankfully everything is ok (good old macs!!). Last year we shot more than 30 former political prisoners in one session at the AAPP office. It was great but now there is the opportunity to take many of those portraits again to get different backgrounds adding diversity to the numbers of portraits we now have. We have managed some last week but the next few days we can concentrate on photographing those who are around in town. In fact we get a surprise call and a former political prisoner not yet photographed is in town at an ABSDF meeting, so we jump on the bikes and head of to the location to meet Myo Min Tun. He was jailed for 1 year in Insein and Maubin prisons and was cellmates with Dr Aye Chan (from Tokyo) and also Aung Din (executive director and co-founder of the US Campaign for Burma). Possibly the most important part of today is the fact that the NLD are due to make their announcement about whether or not they will be taking part in the election. A foregone conclusion as we all know the result already, but who better to spend the morning with discussing the future for the NLD, the election and even the forthcoming football world cup, than an NLD Member of Parliament. Khun Myint Tun was elected MP for Thaton Constituency in Mon State. He was arrested in 1996 and charged with high treason along with hundreds of other members of the NLD. I first met Khun Myint Tun last summer and took his portrait but the chance to meet again was obviously too good to miss out – especially to be spending time with him on the day that his party are about to announce that they are not taking part in the election… an incredible moment to experience. We spent ages chatting and took his portrait in his house – it’s one of the best so far no doubt about it and it carries such meaning as it was taken on the day they said they wont take part in the sham election – as though it was another act of defiance taking this photo. Khun Myint Tun (a member of parliament don’t forget) was jailed for 7 years in 6 different prisons. Back to Thiha’s house to re-group and also an opportunity to re-shoot U Zawana as the one we shot week the before last was too hurried on the day of the 10th anniversary. He is an incredible man having spent 16 years in prison and was only too happy to have his portrait taken again and thankfully this time we got an absolute beauty. You can note in the photo below the iPhone coming in to play again – not only saved the day at Umpiem camp the other day but its also the personal log book with all the info and details i need – a crucial device for the modern day activist/photographer!! The day ends meeting up with Aye Min Soe and he joins us at the tea shop (where else!). Aye Min Soe is a DVB video journalist who worked undercover during the Saffron Revolution. He escaped to Thailand with Thiha when Thiha was released from prison after 17 years inside. They are both now my very good friends and I’m working closely with them on the issue of former political prisoner refugees and the UNHCR issues. We take their portraits again in the market area – Thiha’s being a moment of genius (and luck) as I get a monk in the background and the shot looks as though its inside Burma – highly symbolic I hope. We continue on to dinner at the night market and enjoy the evening relaxing after another long day. Possibly the biggest issue as well as danger faced by former political prisoners when they flee Burma and arrive in Mae Sot on the Thai-Burma border is that they are not recognised as a refugee. In essence this means that they are not safe and their lives are in great danger as they can be returned to Burma at any moment if caught by the Thai authorities. With many Burmese agents, informers and spies on the border area there is a very clear and present danger for all those who arrive here. Having spent years in prison for their political beliefs and activities, they manage to flee the country at great risk, arrive in the assumed free outside world where they are not free or safe. They become stateless people. They are still prisoners. Throughout our time here on the Thai-Burma border we have been documenting the lives, current situations and dangers that the former political prisoners face upon fleeing Burma and arriving here in Thailand. Some make their way into either Umpiem Mai or Nupo refugee camps – not through official channels of course because you see these people aren’t seen as refugees and therefore can’t be given the protection that the camps have to offer (they have to make their own way there… you work it out). Others are left to survive in safe houses with colleagues who have also made the treacherous journey in fleeing Burma over the past years. The UNHCR of course state that their hands are tied by Thailand’s own policy on refugees because it hasn’t signed up to the 1951 Geneva Refugee convention (see below). Unfortunately they wouldn’t answer my calls to meet to discuss this issue. But when you can prove that you have been in prison for your political activities because not only do you have your release card from jail but also your ICRC certificate from when they visited you in prison and documented you and gave you a ‘Special Detainee’ number, when you can prove without doubt your past background as an activist, the torture you have suffered at the hands of the military regime, the years you have spent in Burma’s gulags and therefore without doubt the very real threat to your safety if you are returned to Burma then surely you are a refugee? Clearly the UNHCR and Thailand think differently as more than 100 former political prisoners are living in fear each day that they may be returned at any moment to the SPDC who you can be damned sure know exactly who these people are. It’s why they jailed them in the first place. And what of the third countries that are waiting to take these people who wish to resettle? The USA is leading the way… that was until they put all cases on hold. Take this for an example (a very brief summary and you can read more on a previous post of Nupo refugee camp). A former MP for the National League for Democracy who spent 2 years in Insein prison in 1990 having been charged with high treason. He meets a US diplomat in Aung San Suu Kyi’s compound with her in 1995. He flees Burma to Thailand. He later meets the same US diplomat when he is working for the NCUB. People therefore know who this man is – he is an MP from the NLD who was jailed because of exactly that reason. 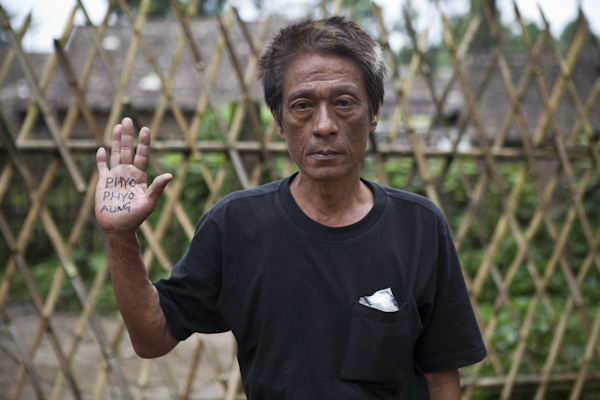 His health is failing due to the torture he suffered when he was being interrogated in Burma. He has to stop working. His son flees Burma to be with him. They make their way into Nupo refugee camp to try to get resettlement to a third country – he is fast tracked by the UNHCR (probably because no-one wants to have the death of someone of his stature on their hands). But then the US Department of Homeland Security decides to put his case on hold. No-one knows why. In the meantime in a bizarre twist of fate, his perfectly healthy son is resettled to the USA. He is still in Nupo refugee camp some 2 years later – still on hold and unable to re-apply to another country until the US decides his fate. There can surely be no doubt whatsoever as to who he is because after all one of their diplomats met him with Aung San Suu Kyi? Then there’s the story of the former political prisoner resettled to the UK yet his wife and young child are still stuck in a refugee camp waiting and praying that one day they will be able to join him and start to live their life… but she is being refused resettlement. Then there is the story of the former political prisoner in a refugee camp who complained about the amount of food rations he and his colleagues were receiving. He was taken away at night into the forest to be shot. Thankfully his colleagues found out in time and he was returned to camp. These are just some of the stories and unfortunately there are hundreds more. So the question is what’s going on… not just with these cases but with policy in general with regards to political refugees fleeing Burma? We are busy working with NGO’s and other contacts on highlighting the situation faced by former political prisoners upon fleeing Burma and will report back soon as our work progresses. We hope to be able to present our findings to the British Government. As Thailand is not a signatory to the 1951 Convention on Refugees they are able to implement their own criteria for assessing if someone is in genuine need of protection. To date the guidelines that have been used have been very narrow and only include fleeing fighting. The argument put forward by the Thai authorities for not accepting new arrivals is that the people who are seeking shelter are not fleeing fighting but looking for resettlement opportunities. A cool damp start to the day and it seems the wet season is starting to close in on us already as we even had a brief rain shower yesterday in Nupo. Today it’s back to Umpiem Mai refugee camp for a second go at getting in – early calls to Kyaw Soe Win and its looking much better today as not only is the Palat away for the day but with just the three of us it’ll be fine. We head of from Umphang on the line car and two hours later we’re at Umpiem Mai. No problems at the market gate entrance and its straight in and off we go through the market – Jackie and Thiha make their own way as we split up to attract less attention. It’s 11.00am now and even though it’s another hot day it’s an overcast sky meaning less struggle with the harsh light and contrast… but this is still going to be probably the hardest day yet. Thankfully everyone is not only expecting us but also welcoming us as always with open arms and hearts, fully appreciating our efforts as much as we fully appreciate all of theirs in joining in this campaign – teamwork at its very best. This time I take a different walking route through the camp to Section 16 way up at the back near the monastery. Walking this way you really get to see the scale of this sprawling metropolis cramped in on the edge of the rolling hills. How so many of these huts survive the harsh wet season is beyond me – many don’t and actually collapse amid mini landslides. Section 16 houses the former political prisoners and political refugees – it’s a really small cramped area but a most welcoming sight as we arrive – again this is Jackie’s first experience of Umpiem having had her first taste of a camp yesterday at Nupo – the differences are only too apparent to see. So many friends greet us who I met last time I was here and have photographed before – Kyaw Soe Win, Aye Aye Moe (and little Thit Synn Moe), Tun Lin Kyaw, Lwin Myint, Aung Moe, Thiha (another Thiha) and all their families. It’s really emotional to be back here with them all but in a good way. Then of course there are the 20 or so new former political prisoners here who I haven’t met before – it’s all so overwhelming but such a special feeling to meet everyone and be here to try to help. The hardest thing about photographing here and today is not just trying to find suitable locations to deal with the often harsh sunlight but actually trying to find over 20 different backgrounds altogether in such a small area. Unlike Nupo where it was slightly more relaxed in being able to walk around the entire camp it’s just not possible here. So we have to really stay within the confines of Section 16 and it’s several hundred square yards and the next few hours are spent scrambling around over every square inch of Section 16 and I think we did pretty well with the end results all things considering! But that’s not all we have to cope with – there are also over 20 people to interview and note down all their details… as well as choose names to go on their hands. This is where the Secretary General takes over and lets me concentrate on trying to get the pictures right in my head and then in the camera. Without her and Thiha it would have been complete meltdown. One after the other, the former political prisoners take it in turns to step into Kyaw Soe Win’s house, register and then get photographed… if only the UNHCR took such an interest in these people and did the same thing. If only. This is another of the main reasons for us being here today – as per Nupo yesterday. We are working hard to document the situation for these former political prisoners and try to help them in their desperate plight of getting recognised as refugees. Today we carry out a number of interviews on camera – a broad selection of some of these former political prisoners who can go on camera and tell us their stories. Kyaw Soe Win and Thiha help organize people and Jackie carries out the interviews… and I get a short rest in the shade for half an hour… and a cup of Burmese tea of course! For more about this issue read my previous posting HERE. The day is a huge success but most importantly has been enjoyable and spent with some very special people – friends. In all we have photographed, interviewed and documented 22 former political prisoners in about 4 hours!! Unfortunately about 5 people were unable to make today as they were away from camp working or otherwise engaged – a couple of Karen former political prisoners being engaged in the struggle across the border – our thoughts very much being with them as well. Even though we had photographed some people before, today gave me the opportunity to actually photograph them under better conditions and in a better frame of mind… with my Leica round my neck: Lwin Myint (9 years); Kyaw Kyaw Khine (20 years); Aung Moe (7 years); U Win Myint (9 years); Aung Ngwe San (3 years); Aung Than (18 years); Aye Aye Moe (2 years); Khine Thaung Kyaw Aung (8 years); Kyaw Kyaw Lwin (8 years); Kyaw Soe Win (4 years); San Myint (3 years); Saw Than Hla (23 years); Soe Myint (3 years); Than Than Sint (4 years); Thiha (7 years); Thin Min Soe (4 years); Tun Lin Kyaw (3 years); U Thawbita (1 year); U Ukantha (2 years); U Wituta (9 years); Yan Aung Shwe (10 years); U Zaw Win (7 years). 22 people photographed – 161 years in prison. There’s really nothing more you can say. Making the final line car back to Mae Sot was always going to be a push due to everything we had to try and fit in today and as we are here it seems crazy to dash away without spending all the time we can with everyone. So as we headed back down the hills towards the Market gate stopping off on the way at aye Aye Moe’s house, U Zaw Win’s house and a final stop to see Saw Than Hla again. We had missed the final line car but no problem… as though welcoming us with open arms for what we were trying to do, one of the camp officers was heading into Mae Sot and offered to give us ‘Teachers’ a lift back for a few hundred baht. We gratefully accepted, climbed aboard the open back truck and before we had passed through the checkpoint I had passed out. Massive thanks to Kyaw Soe Win as always. Mission accomplished. Click HERE to view all of the portraits of former political prisoners in Nupo refugee camp. An early start for what will be a long day – or rather an intensive day as we have to try and wrap things up before the sun gets too high overhead and we’re left with nothing but shadows and highlights. Last night we had a meeting with many of the former political prisoners here in Nupo to learn more about their current precarious situation living in the camp and the ongoing disgraceful situation in regards to the UNHCR resettlement program. There is great fear amongst many here that they will be returned to Burma – all refugees that is – after the election. There are already noises being made from Thai authorities than suggest that this could be the case. Perhaps this goes some way in explaining why the USA has all cases currently on hold. So it’s an early start after sleeping in the camp last night and after morning coffee in the school’s coffee shop “Memento” we started with the portraits. Luckily a group of former political prisoners met us early at ESC school so we started looking for suitable backdrops around the school. First up were Myint Oo (5 years in Insein, Bago and Taungoo prisons), Kyaw Han (3 years in Sittwe prison) and Zaw Win Naing (4 years in Myeik prison). The day is almost a race against the clock as we have to get the last line car out of Nupo at about 3pm or we get stuck here (no bad thing in my book) but with a tight schedule we cant afford any more slip ups like yesterday. Also it’s a race against the sun – in fact the whole thing is one continual race around everywhere, tracking people down, trying not to draw too much attention to yourself – it’s a total challenge that is impossible to do without the ever present help of Thiha and of course the Secretary-General Jacquelin San who as well as being on interview duty and translation is also filming everything – and she’s getting very good at it to! First ones in the can (as they say) and we spend the next few hours trekking across Nupo camp starting in Section 16 where all POCs are living. It’s a cramped section of the camp in comparison to almost all other areas – another hardship faced by former political prisoners and their associates – conditions also vary across the camp depending on the usual things in life – how how much money you have and who you know. The portraits keep coming thick and fast – first up my good friend Ma Khin Cho Myint @ Zulu who was photographed for the 3rd time (the previous two political prisoners had been released so she now is known by everyone as having the lucky hand!). She was jailed for 6 years in Insein and Moulmein prisons. Zulu has been the main organiser here in Nupo so a massive thanks to her for making today come together so well. Making our way swiftly through Section 16 we pick up quite a crowd along the way, one by one having their portrait taken as we desperately try to quickly find differing yet most importantly interesting backgrounds to be able to take the portraits – Kyaw Win Swe (7 years in Insein and Mandalay prisons), Kyi Toe (3 years in Insein and Tharawaddy prisons), Kyaw Zaw (11 years in Insein and Kalay prisons), Su Su Win (8 years in Insein prison), Kyaw Tint Oo (2 years in Maubin prison), Win Hlaing (6 years in Insein and Thayet prisons), Yu Yu Hlaing (1 year in Myant prison) and her husband Soe Moe (6 years in Dawei prison). We also had time in passing to catch up with Lwin Lwin Myint (U Gambira’s sister) who with her husband were busy building their new house. Heading across towards the monastery on the other side of the camp we take a detour to the graveyard where two former political prisoners who died whilst in the camp are buried. 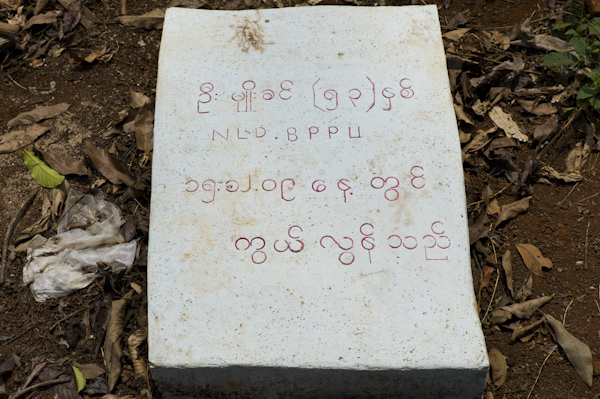 U Than Myint (who’s wife and child we met and photographed – see above) passed away on 23rd January 2009 aged 52. 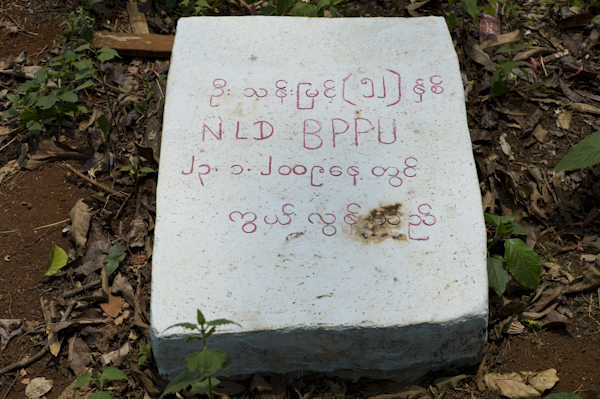 He was a member of the NLD and BPPU. Unfortunately I never had the chance to meet him but when I visited in July last year I met Myo Khin. He had been jailed for 7 years in Insein and Tharawaddy prison and he was suffering form bad health coupled with no home in the camp – his life was one of extreme hardship and makes you seriously reflect on everything you have in comparison. He died on 15th December 2009 aged 53. He was a member of the NLD and BPPU. I was very sad to hear that he had passed away in of liver failure amongst other serious health problems. Both men had gravestones in the rundown graveyard of Nupo camp – it was a true moment of reflection and sadness. Our final stop was over at the monastery to photograph U Aubar before making our way back through the wide open boulevards (in comparison!) of the Karen section of the camp to ESC Nupo for a final meal and well earned rest before catching the line car back to Umphang. Yet another brief but totally exhausting and truely rewarding time spent in Nupo camp. I thank you all for everything that you did and hope that in turn we can in some way help with your current situation. God knows we’ll try. Thailand Day 7: Umpiem, Nupo… Houston We Have a Problem. The usual early start heading south to Umpiem Mai refugee camp but we only just make the line car as it’s packed up and ready to go half an hour early! The day ahead is going to be hectic – there are more than 30 former political prisoners in Umpiem Mai refugee camp and most of them will be photographed today. Getting into the camps is often a game of cat and mouse with the authorities. Either a few hundred baht changes hands and a look the other way as you sneak in the gate or if you’re lucky you may be able to sneak in without having to pay some tea money. Either way the bottom line is you’re not supposed to be going in – the Thai authorities don’t want photos, videos and reports coming out of what like is life inside these camps. The usual way is to be a ‘Teacher’ or ‘Missionary’ for the day. But today I am concerned about getting in as we have company with us which on a normal day I would be more than happy to have but today is about the issues we are trying to cover for former political prisoners and we can’t afford getting caught or not getting in to the camp. The route south is nothing but the usual – checkpoints where those without papers are hauled aside and have to part with whatever cash they have to be able to continue their journey. It’s just another part of the perilous life of a stateless person on the Thai-Burma border being exposed to corruption at every turn. About 30 minutes from Umpiem Mai cmap we are pulled over at the top of a hill by the Thai police – it’s a random checkpoint and there about 30 police in total – many armed, ready and waiting to fill their pockets with a little extra cash for the weekend – they are in for a nice surprise when they stop us as we had just picked up 19 Karen refugees on their way to a day’s farming… a handsome reward for the Thai police even if they had to do their best to extort money away from the eyes and ears of the foreigners amongst us on the line car – we filmed what we could and you can just make out the Karen woman ‘talking’ to the police in the clip above. We finally make it to Umpiem Mai and meet Kyaw Soe Win at the gate as planned, but this is where the plans go wrong (as I had expected form the start). There is no way we are going to be allowed in today as we are too many people. If it had just been Thiha, me and Jackie then no problem – we could sneak in as normal, but with the extra (white western) faces accompanying us its obviously a no go. No time to be disappointed as when one door shuts another opens and we change around our entire schedule and decide to head straight to Nupo and come back here on Sunday… when the Palat is away!… (just us 3) providing we can catch the last line car form Umphang and also get a message to the camp that we are on our way (they aren’t expecting us until tomorrow). There is no phone reception in Nupo camp but with the wonders of modern technology I send a Facebook message via my iPhone to John Glenn in Houston, Texas, who then in turn gets a message to our contacts in Nupo Camp informing them of our imminent arrival… Houston we have a problem!! Digital democracy at it’s very best!! We catch the next line car down to Umphang and just make the last connection to Nupo camp by the skin of our teeth. It’s becoming a bit of a habit just making these connections wherever we are in the world… it’s as though it’s just meant to happen. The road to Nupo has been vastly improved since my last visit just 6 months ago and we arrive much quicker than expected giving us time to take several portraits in the early evening before the light disappears – the call ahead had already been made by John Glenn from in Houston to prepare whoever was available – great teamwork! So here we are back at ESC Nupo (English Speaking Course) and a warm welcome as always – it’s great to see Robin, Min Zaw Oo, Ton and everyone again and a real honour to be able to stay in the camp at the school. This part of the trip wouldn’t be possible without the help from all at ESC so a huge thanks to you all. Nupo camp is home to approximately 25+ former political prisoners, mostly living in Section 16 and most of whom I photographed on my last visit back in July. But the light was not so good back then and the portraits were all rushed and also with many of the same backgrounds. Also most importantly, with the Leica back in my hands these portraits will simply rock. So without any delay we decide to get the shoots underway as tomorrow we will only have the morning to work with as it gets too bright after about 11am and we have to head back to Umphang and then on to Umpiem Mai on Sunday. This time our trip to the camps is taking on an extra dimension as we are also documenting the current perilous situation for former political prisoners on the Thai-Burma border where they are basically stateless people as they are not being recognised as refugees by the UNHCR or Thai authorities. You can read more about this issue on a seperate blog entry here. The first person who we not only take a portrait of but spend some time interviewing is U Chit Tin, a former member of parliament for the NLD. Jailed for high treason in 1990 when he was one of 35 NLD MPs who met in Mandalay to form an alternative government, U Chit Tin is now awaiting resettlement like so many here in the refugee camps. (You can read about his story here). U Chit Tin spent 2 years in Insein prison and amongst other things in his life as an NLD MP he was in the lead car in front of Daw Aung San Suu Kyi when they were attacked at Depayin. Imagine an MP from your Government going through that as well as torture and oppression for 16 years and now being forced to live in a refugee camp… A complete and utter farce is the only polite way to describe this mess. With the light fading we manage to take 5 more portraits this evening which makes all the hassle and misfortunes of earlier pale into insignificance. We photograph Naing Linn (2 years in Pathein prison); Moe Kyaw Aung (7 years in Insein & Tharwaddy prisons); Than Oo Myint (1 year in Moulmein prison); Moe Kyi (3 years in Insein, Bago & Tharawaddy prisons) and finally Soe Myint Aung (3 years in Insein and Tharawaddy prisons). As the evening drew to a close we headed back to ESC for some dinner and a good catch up with everyone. It may sound strange to say it but it’s great to be here and I only hope that next time I come back we can have made huge in-roads on not only the political prisoner issue inside Burma but also that of those in peril as stateless people living in these camps. Tomorrow we leave for a flying visit to both Umpiem Mai and Nupo refugee camps where over 40 former political prisoners are ready and waiting. It’s going to be very hard work and based on previous experiences it’s a frantic race against the clock – but more about all that over the coming days as we re-experience it. Today we finally get to put our feet up for a few hours as we have fairly comprehensively photographed Mae Sot’s contingent in the last 48 hours. With the main focus with the political prisoner issue naturally revolving around the reasons of arrest and subsequent treatment in prison, another major element lurking in the background is that so many are forced to flee – leave their home, their country. This is the same for so many people in Burma – there are 160,000 people just sitting in the camps that litter the border – all waiting to go home, some having been here almost 20 years, others it’s all they’ve ever known. I took Jackie down to the Friendship bridge that links Thailand to Burma and for the first time in 10 years she was able to see her homeland – albeit Myawaddy. But imagination is more important than knowledge and in opening your mind and seeing beyond the Dawna mountain range I can only imagine how many people might stand here and dream if only for a second about what once was and what hopefully will be again. I can only imagine what those feelings must be like to see your homeland so near but yet in reality so far. Kyaw Thu Htike arrived late last night with his wife and young son (full audio interview will be posted soon). He was jailed for 1 and a half years in Insein and Taunglaylone prisons having been arrested in March 2008 under section 13(1) and 505(B) – the antiquated law that is often thrown at political prisoners… “Whoever makes, publishes or circulates any statement, rumour or report… (b) with intent to cause, or which is likely to cause, fear or alarm to the public”. He was released in September 2009 under the amnesty despite having been sentenced to 7 years in prison. We chatted for ages and it was incredible to hear testimony first hand from someone who had only a few hours escaped from Burma. The long road ahead to real freedom lies in wait for Kyaw Thu Htike but at least tonight he is a free man, if only from the Military Intelligence officers waiting outside his door each day back home in Rangoon. A slow start to the day after the celebrations of yesterday that ended up late on with karaoke in MyMaesot – Ko Tate Naing flexing his vocal chords and keeping everyone entertained. Rachel had made it down from Chiang Mai as well and it was great to catch up with her now that she’s back out here. First stop today was a meeting about the Burma trip – naturally I can’t go into details but at least some of it will be revealed very soon indeed in the international media. The idea to photograph former political prisoners inside Burma is obviously the most challenging part of this campaign yet – for my part there is obviously the risk that I will get caught with someone or somewhere I shouldn’t be and most likely get deported (maybe worse… we’ll have to wait and see) but the biggest risk is obviously for those former political prisoners who i’ll be meeting and photographing. They are watched the whole time by military intelligence, so meeting isn’t easy which is why we’ve been planning this for many months now. Then there’s the contacts working on the underground who can’t risk being exposed. If they are, then its 20 years inside. No questions asked. The risks are huge but everyone is willing to take them. A sign if ever one was needed of belief in what the message of this campaign is all about. All we have to hope for now is that we have the platform for this work should it all go to plan. After the rush around town photographing 11 people yesterday, you could be excused for wanting a few hours off to check progress, but there’s no time for that. After our morning meetings its straight back on the bikes and first stop to see Daw San San, National League for Democracy elected Member of Parliament and former political prisoner at her home in the back streets of Mae Sot. During the 1988 uprising the Workers Union was formed and she was duely elected chairman but as the military cracked down she was forced to retire. Having previously worked at the Labour department of the government, it was her expertise in this field that was to lead to her playing a prominent role in the NLD and in 1988 she joined the NLD becoming secretary of the Central Labor Working Committee. In 1990 she was elected as member of parliament for Seik Kan Township in Rangoon but as the military refused to hand over power she fled along with many of her MP colleagues to Mandalay. It was here that the regime arrested 35 MPs accusing them of meeting to form a parallel government. Daw San San was one of those arrested. Charged with high treason she was sentenced to 25 years and sent to Insein prison. In 1993 under the General Amnesty 1/93, Daw San San was released from prison – like many her sentenced commuted on condition of non involvement in politics in the future. 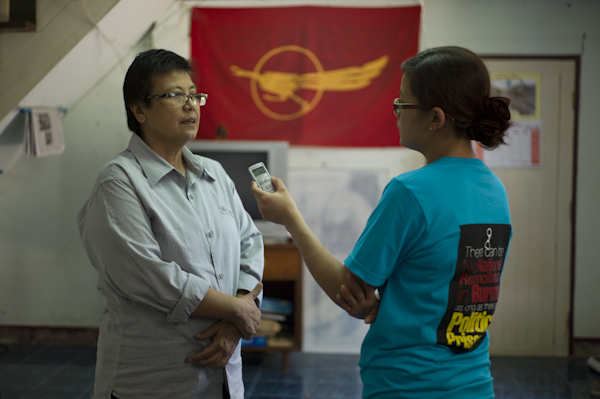 In 1997 Daw San San was interviewed by the BBC via telephone and despite knowing that her answers and by identifying herself would result in her arrest she spoke with them, outlining the current situation and providing details of MPs currently in prison. Eventually as she expected, the authorities arrested her and she was returned to Insein to serve the remaining part of her sentence. She was finally freed in 2001 and forced to sign 401/1 (agreeing not to partake in politics in the future). She was given back her title of vice-chairman of NLD Rangoon Division and continued working in her role. Faced with the ever present threat from the military and having been arrested several times in 2003 around the time of the Depayin Massacre she finally fled to Thailand where she continues working as an elected member of parliament for the NLD and as vice president of the MPPU. As luck would have it and is so often the way out here, you end up bumping into someone you need to meet and Eai Shwe Sinn was here at Daw San San’s house so we re-took her photo – as always when she’s not filming or doing interviews, my beautiful assistant acts as stand in – this time even managing to wear the same colour top to make my life as easy as possible! There is no end to her skills. The rest of the day like yesterday is spent going from one place to the next and a further 5 newly arrived former PPs are photographed. Saw Mo Shay was sentenced to 10 years at the age of 15 in 1994 and spent 11 years in Insein, Tharawaddy and Moulmein – he received a further 2 year sentence for his alleged role in a prison break to which he took no part. Back at AAPP office we hook up with new member of staff Aung Khaing Min who has been living and studying in USA. He was jailed for 5 years in 1997 in Insein and Taungoo prisons and many of his family including his brothers are still detained in Burma’s jails. 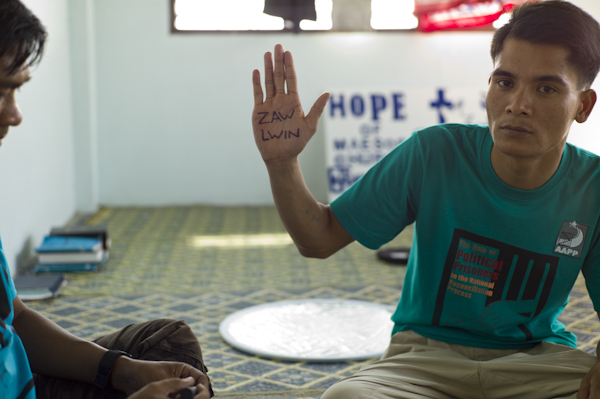 On his hand is written the name of his brother Chit Ko Lin – when he was in Rangoon as a student activists between him and his brothers they all knew they would be arrested so they took it in turns to cover each others tracks until they had all been caught. Family links are so common for those who are detained or have been – so many brothers, sisters, cousins are jailed, if not for their direct involvement then because their family members are at large so the authorities arrest anyone they can find. We met Thet Naing at the ‘Knowledge Zone Vocational Training Centre’ that he set up last year. He had arrived in Mae Sot in 2005 but until now I had not had the chance to meet him. He had spent 8 years in 4 different prisons – arrested in 1988, again in 1997, he fled to the border in 2005 with his nephew… so the SPDC arrested his niece and sentenced her to 11 years in jail. She is currently in Umpiem Mai camp and we will meet her tomorrow. 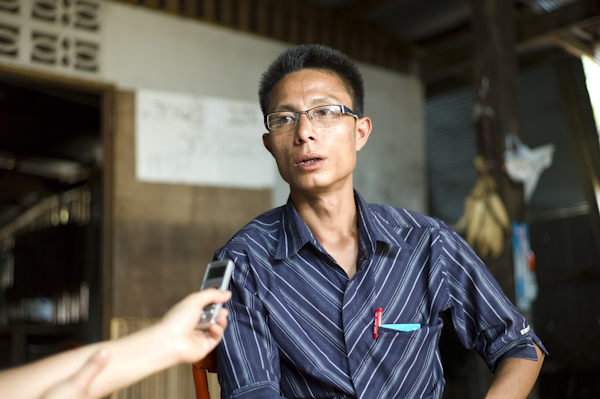 Next up was Thet Khaing who we met at the ABSFU headquarters – he had been sentenced to a mind numbing 38 years in 1998. Thankfully he only had to serve 4. Our final stop of the day was to meet Yi Yi Win who spent 3 years in Insein prison in 2004. Her husband is also a former political prisoner but is currently living in Norway, having had success on the resettlement programme. Yi Yi Win is waiting to join them but like so many currently living in a state of statelessness here in Mae Sot. With the light fading fast I ran up and down the road desperately trying to find a spot to take her portrait. Sometimes you need look no further than right in front of your eyes and we took it on her doorstep. So much for thinking there were only a handful of new arrivals since last being here in Mae Sot 6 months ago. 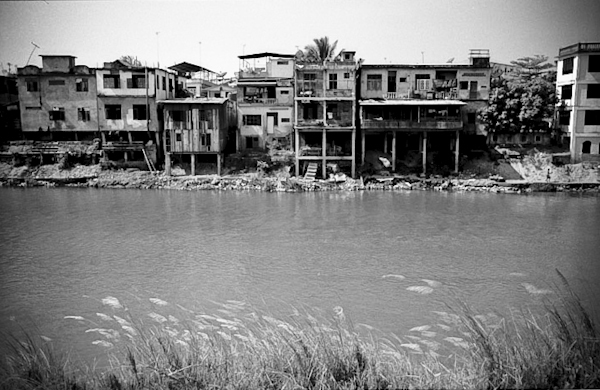 The General Amnesty of September 2009 where 128 political prisoners were released had seen a signifcant number of people flee across the border since then – both those who had been released and others whose lives had become un-liveable as a former political prisoner inside Burma. In short the only difference is that once released from prison you are no longer in a cell. Almost everything else about your life remains the same but just in a different context. Constant monitoring, harrasement and mental torture by the regime and its thugs – for a former political prisoner life can so easily cease to exist as everything is taken from you – even your friends and family. Many are therefore forced to flee across the border into Thailand – this is not easy and is a trip faced with extreme danger. As a former political prisoner you are always watched and being caught trying to flee brings about an immediate return to jail. So as the 10th Anniversary event came to a close in the mid-day sun, the first day of shooting got underway almost straight away. The next few days were going to be very busy – the initial estimates of 5 or so new faces were way off the mark. The next 5 hours saw us race around town on the back of bikes as we met , interviewed and photographed 11 new arrivals in Mae Sot since last being here: Daw Cho Mar Htwe (11 year), U Zawana (16 years), U Sandawbartha (16 years), U Thawbita (1 year), Soe Lwin (15 years), Moe Kalayar Oo (6 years), Soe Htike (8 years), San Lwin Oo (2 years), U Kyaw Kyaw (6 years), Sein Kyaw Oo (5 years), and Thwin Linn Aung (5 years). In one afternoon 11 people had spent almost 100 years in prison. One of the first people I heard about that had recently arrived was Daw Cho Mar Htwe. She was arrested in 1998 as a member of the NLD and spent 11 years in Insein and Moulmein prisons before being released in the Amnesty of September 2009. 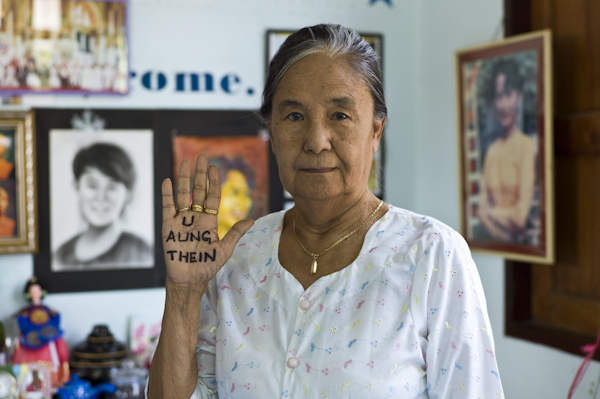 The funny thing was that my good friend Ma Khin Cho Myint @ Zulu had written Cho Mar Htwe’s name on her hand when I took her portrait in Nupo camp last year. It was the second time I had had to take Zulu’s portrait as the original name she wrote on her hand had also been released… so with Cho Mar Htwe now having been released I needed to take yet another picture of Zulu… her hand was now quickly becoming known as the lucky hand! So first stop was to Lae Lae’s house where Daw Cho Mar Htwe was now living – in fact whilst we were there we also photographed Sein Kyaw Oo and Thwin Linn Aung – who was of particular interest to Jackie as he had been a prominent student leader at Rangoon university during the student uprisings in 1996 whilst she had been one of the many junior students who sat in the road at Hledan junction listening to their seniors speaking. Then it was a race across town to see Moe Kalayar Oo and her husband Soe Htike. Moe Kalayar Oo spent 6 years in jail because of her participation in the demonstration during the funeral ceremony of U Nu. During the Saffron Revolution she was a member of the 88 Generation Students but evaded arrest and went on to assist Nargis victims in 2008. But the authorities finally caught up with her so she fled with her family. Her husband Soe Htike had been involved in the All Burma Students Democratic Movement and was arrested in 1991 spending 8 years in Insein and Tharawaddy prisons. Like his wife he then became a member of the 88 Generation Students and was one of the core group outside Insein prison every day whilst Daw Aung San Suu Kyi was on trial in summer of 2009. Back across town again to Thiha’s home for a meeting with monks U Zawana and U Sandawbartha. Both had spent more than 16 years each in prison – much of it together in Insein and Tharawaddy. Both were from the same monastery in Rangoon – Shwe Pyi Thar learner’s monastery and U Sandawbartha being arrested 2 days earlier and both were finally released in September 2009. In 1992 U Zawana met with UN Special Rapporteur of human rights Mr. Yozo Yokota and gave evidence on the situation inside the country. He was subsequently sentenced to 29 years in jail – full interviews with both will be available soon. Staying in Thiha’s house temporarily is Soe Lwin – 15 years in 4 different prisons having been sentenced to 24 years in jail. It’s so hard to get your round being with someone so young who has spent half of their life in prison for absolutely no reason. It’s always a time to reflect on so many things whenever I meet a former political prisoner, but also it provides you with such an amazing sense of inspiration. Anything is possible if you put your mind to it. Just ask these people who have survived hell. The final stop of the day was to visit the People’s Volunteer Association being run by former political prisoners San Lwin Oo arrested after Saffron Revolution in 2007 and U Kyaw Kyaw – a solo protester arrested in 2003 and who has been jailed for 6 years. The organisation was formerly known as the “Burma Volunteers Association” and is a non-profit association taking a leading role to solve the social conflicts in the migrant community in Thailand. We photographed both men in a dusty road where the office is located but also is the home to hundreds of Burmese migrants – as though stacked one on top each other like chickens in a battery farm. It may be a sense of freedom from the oppression behind the walls that is Burma but its a very long way from the world that most people are lucky enough to be able to enjoy. As the last of the light disappeared we headed back to AAPP to join in the celebrations (see part one of this post). A completely unexpected start to have photographed so many in one afternoon and simply not possible without the ever present help from Thiha and also the Secretary General keeping me on the straight and narrow and concentrating on what I had to do. without them both doing all the real hard work in interviews and planning then most of this campaign just wouldn’t have the depth that it does. 100 years in prison in one day. There’s nothing to add to that sombre fact. 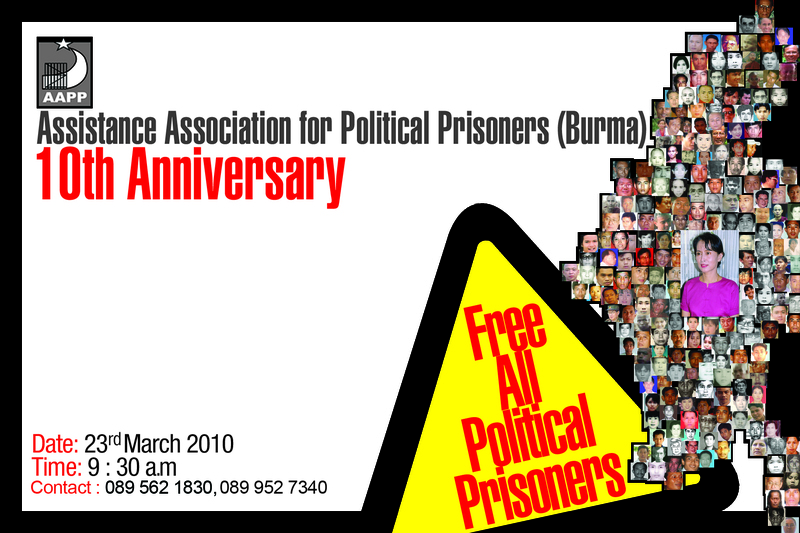 Ten years ago today, on 23rd March 2000, former political prisoners from Burma living in exile in Thailand formed the human rights organisation the Assistance Association for Political Prisoners (Burma), more commonly known as the AAPP. The date of 23rd March has relevance as it is the anniversary of the arrest of student leader Min Ko Naing in 1988. 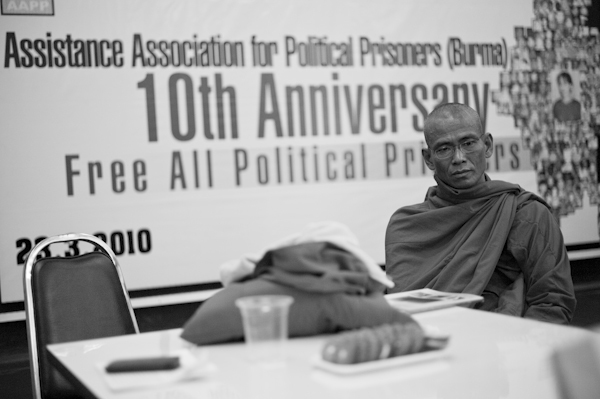 For the past ten years, AAPP has cast light on the dark situation that is the hell of Burma’s prisons and the political prisoners that have suffered within them. It has played a vital role in reporting to International governments and the UN on the situation of political prisoners in Burma and has campaigned vigorously and untiringly to both raise awareness and bring about change. It provides a voice and support for the 2,186 political prisoners currently incarcerated in Burma’s jails and also assistance to their families and those who have been forced to flee into exile. The day starts in a rush and thankfully we grab a lift from Dr Naing Aung from the AAPP office to the Rujira Hotel on the outskirts of Mae Sot – where the celebrations are being held. 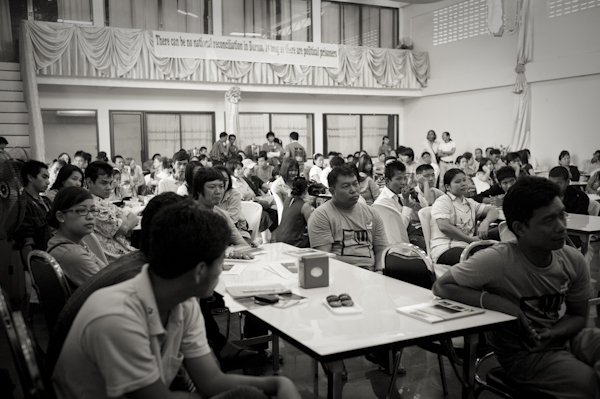 More than 150 people had gathered to this special occasion – former political prisoners, activists, exiled NLD Members of Parliament – the room was awash with important people who had come to acknowledge not just the work and tenth anniversary of AAPP but more importantly the fact that 2,186 people were still in jail and the fact that a significant number of those people should be playing important roles in the forthcoming elections. 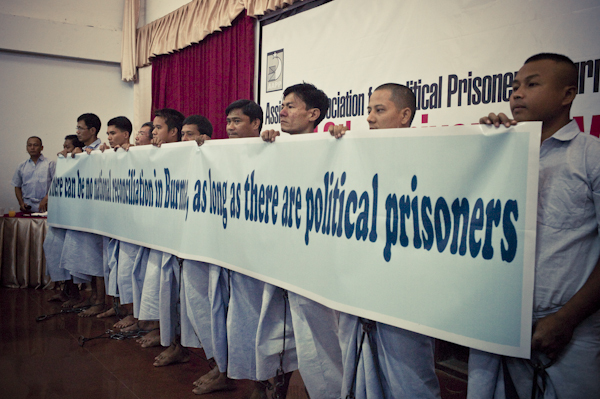 Former political prisoners dressed in their blue prison uniforms carried a banner that re-iterated this message “There can be no national reconciliation in Burma as long as there are political prisoners”. There is really no other way to put it. It was a strange experience to know so many people in the room – to have been privileged to have shared the lives of so many of them for this project; an honour to be a part of this family. I wouldn’t have missed this for the world. Anniversary t-shirts in the prisoner colour blue were handed out to all and the MCs Moe Myat Thu and Ma Suu Mon Aye got things underway. The former political prisoners performed to the packed hall and a number of prominent activists and former political prisoners spoke to the audience. It was a great day and I spent most of the event wandering around chatting to people and taking the odd photograph – you can see the photos here. Also with so many former political prisoners gathered in one place it was also a great opportunity to start planning who to photograph and a real coup as Daw San San, NLD MP, Vice President of the MPPU and former political prisoner agreed to have her portrait taken later in the week. In fact our initial estimates of 5 or so new faces to photograph in Mae Sot were way off target. We also caught up with Ma Thida who was over from DVB in Oslo – so many friends everywhere but a big surprise for Jackie who met a very special old friend (now in Generation Wave) whom she hadn’t seen for ten years since having to leave Burma in 2000. It was a wonderful moment to enjoy a re-union and such a small world to be re-united here in Mae Sot both fighting as activists for their country. To mark the 10th anniversary the AAPP were launching their new report “The Role of Political Prisoners in the National Reconciliation Process”. The report calls on the international community to press the military junta to unconditionally release all political prisoners, review the 2008 Constitution, and begin a tripartite dialogue. But the report also calls for the criminal records of all political prisoners to be erased. The 2010 election and party registration laws prohibit current prisoners including Daw Aung San Suu Kyi and U Khun Tun Oo from standing for election or belonging to a political part – and this is a key point if there is to be any sense of real democratic change and progress for Burma. You can condemn the constitution, repression and general disastrous human rights situation throughout Burma all you like but the basic fact that the very people who were not only originally elected to run the country but who are also who the people of Burma would still want to play a role now in shaping its future are still in jail. Their unconditional release and involvement in the political process is fundamental if there is ever to be meaningful change in Burma. The new report was launched at a press conference and the whole event was filmed by Democratic Voice of Burma DVB and you can read all about the days events here in a report from The Irrawaddy. The celebrations continued throughout the day culminating in an evening event held at the office of AAPP for former political prisoners and a selection of specially invited guests – time to really celebrate and for me an incredible moment as a slideshow of the 115 photographs of this project was played on a big screen to everyone – amazing feeling to see all these former political prisoners watching their colleagues from all over the world – it made all the hard work really seem worthwhile to have it shown and acknowledged in such company. Everyone partied long in to the night – a well deserved day of celebration but also acknowledgement of the role of political prisoners in Burma’s past, present and future.